JAF Launches Annual Fund – Join The JAF Smile Brigade! Those pledging a yearly contribution towards the Foundation will join the JAF Smile Brigade – annual donors committed to helping defeat frowns all across the region! Anyone wishing to join the JAF Smile Brigade can make an annual or monthly contribution at any point during the year, though we chose December to launch the fund because of the incredible generosity displayed by so many around the holidays. Plus, there is still time to make a tax-deductible contribution to the annual fund before the end of the year. Really, the timing is perfect. Think of how far $700 can go to help with a monthly mortgage payment, or what $500 could do for a family struggling to make rent during treatment cycles. Think of last winter, and how$250 could have alleviated the strain of a monthly gas or oil bill. Even $100 can help families pay their phone bill, and $50 can provide much needed groceries. And that’s why we need your help to alleviate cancer’s financial burdens on patients and families so they can focus on what really matters: smiling and getting better. 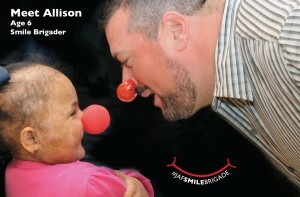 So visit www.JAFSmileBrigade.org to learn how you can contribute to our annual fund to help JAF patients – like Allison. Allison relapsed in 2012, and doctors told Yazel and Jorge a bone marrow transplant was the only way to cure their daughter. After the transplant later that year, Allison developed Graft Vs. Host Disease (GVHD), a complication fatal in 20-40% of patients, where the newly transplanted cells attack the recipient’s body. Because of Allison’s many medical complications pre and post transplant, Yazel had been unable to work for several years, leaving Jorge – a housekeeping professional – as the family’s sole source of income. Allison continues to fight, receiving daily injections at home along with weekly treatments at the hospital, but, just like her parents, her spirits remain high. While either dancing to her favorite songs, watching her favorite movie (Snow White), or taking in the circus in Boston, Allison’s positive spirit is a reminder that there is not only life after – but there’s also life while living with cancer. Donate today by making an annual contribution, or by joining the monthly (Up)Beat Pledge Program, and help us alleviate cancer’s financial burdens on patients like Allison and parents like Yazel. You will be giving the ultimate gift: a reason to smile.